Summer is in full swing and you know what that means–it’s bad driving on the beach season! The people in this poor Jeep Wrangler were probably having a lot of fun until the ocean tried to eat their vehicle. It damn near got the thing, too. 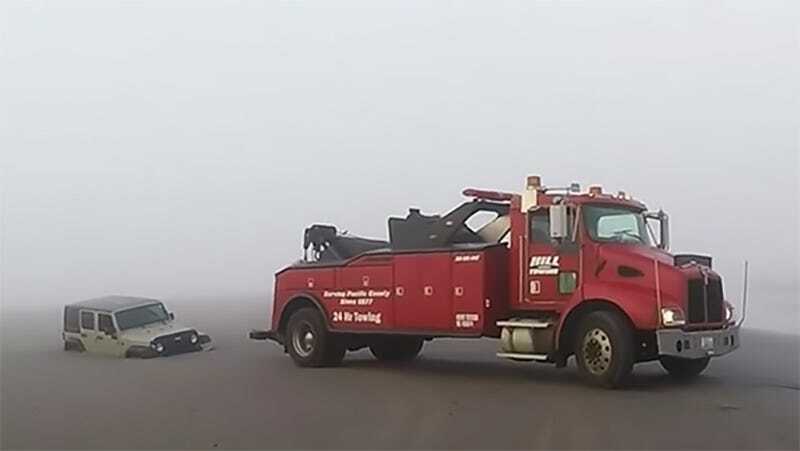 Here are a couple new videos from Hill Auto Body & Towing, a Washington-state recovery outfit with a pretty entertaining YouTube channel documenting vehicular rescues. I really like the first part of this particular escapade. Beautiful beach sunset scene, the soft and reassuring clatter of a diesel engine. And hey, is that a Jeep in the surf? Sure was, buds. That soon-to-be-rusty Wrangler was way, way too far from the hardpack to be safe as you can see by the waves crashing up against its body panels. The recovery crew had to wait for the tide to go down–yikes–before it could dispatch a hugely powerful wrecker to extract the mired Wrangler from very heavy looking sand that was saturated with salt water. Even though the ocean gave up trying to eat this Jeep, the sand was still making a fair effort and as you can see, it took a lot of labor to get this 4x4 out of the Earth’s clutches and onto a flat bed. If you happen to be driving on the beach this summer, let me go ahead and advise you to stay the hell away from the wet sand. At the very least, you’re exposing your machine to salt which it will hate. And at the worst, well, you’re pretty much watching it unfold here. Or maybe just leave your car off the beach?